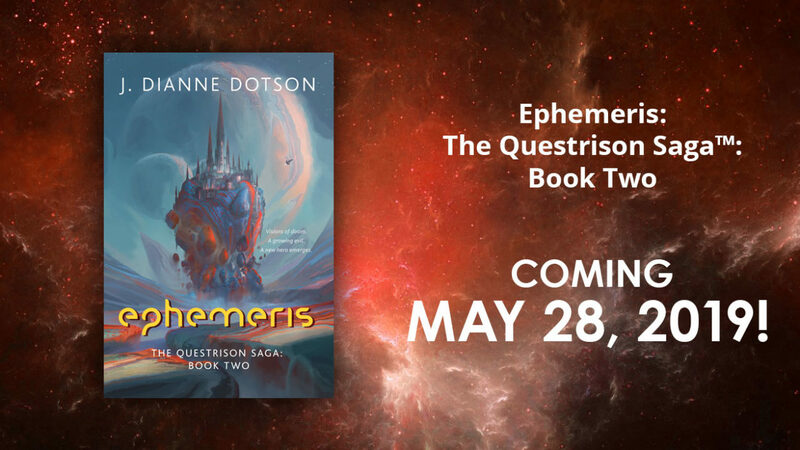 Announcing EPHEMERIS: THE QUESTRISON SAGA™: BOOK TWO Arriving May 28, 2019! Watch the first Ephemeris book trailer video HERE. Current pre-order links can now be found on the Ephemeris Book Page or on my homepage! Order from your favorite bookseller. Pre-orders help to ensure there are plenty of books in stock on publication day. You can also add Ephemeris to Goodreads via a widget on that dedicated book page. I will be updating my homepage and Book Page with additional order info for Ephemeris as soon as it posts. And stay tuned for a fabulous BOOK LAUNCH for Ephemeris at Mysterious Galaxy Bookstore in June! There will be epic swag! The teaser trailer was made by me. Thank you for following me and supporting my work! I can’t wait to share Ephemeris with all of you! Image Credit: Cover Reveal for Ephemeris: The Questrison Saga: Book Two by J. Dianne Dotson. Book Cover Art by Leon Tukker, Cover Design by Robin Winters. Copyright J. Dianne Dotson 2019.